Bridal Pearl Necklace, "Sunny Clouds"
Carnelian peeks between luminous pearls like sunshine from clouds. Somluck Komolmith crafts a choker of stunning simplicity. The double row of gemstones fastens with a sterling silver clasp. 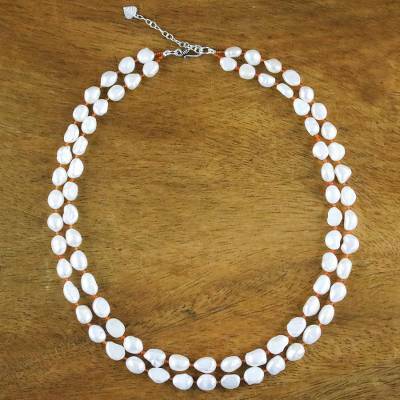 You can find pearl and carnelian strand necklace 'Sunny Clouds' by Somluck Komolmith in jewelry categories such as Bridal Necklaces, Birthstone Necklaces, Carnelian Necklaces, Pearl Necklaces, Silver Necklaces, Sterling Silver Necklaces and Pearl Strand Necklaces. Enjoy exploring these sections for other Novica treasures.